Camilla Parker-Bowles was photographed struggling while eating ice cream during a recent outing. On Tuesday, the Duchess of Cornwall met Dame Judi Dench, who has portrayed Queen Victoria and Queen Elizabeth during her legendary career. During their outing, they were spotted eating ice cream. During their encounter, Camilla was caught dribbling with her ice cream. Dench who is ever ready was photographed offering a tissue to help Camilla clean up. [post_ads]One netizen who saw the photo found Camilla's mess funny. The Twitter user compared the royal to her 5-year-old daughter and called Camilla a "sloppy eater." "Good god our 5 year old manages to eat a cone without getting it all down her chin never seen such a sloppy eater," Lynnette Lock wrote. Rebecca Sullivan, a lifestyle reporter at News.com.au, shared Camilla's photo on Twitter. "Glad the paps weren't on me the last time I stuffed my face with ice cream," she wrote in the caption. According to People, Dench was set to show Camilla around the Osborn House estate including the newly restored Durbar Room where "Victoria and Abdul" filmed, which Dench starred as Queen Victoria. The two women looked at framed pictures taken during the making of the movie. Camilla was heard saying "Ah, here you are, Judi," while Dench reminisced how it was staying at the North House hotel in Cowes during the filming. They were later seen in a horse and carriage ride with Camilla up front and Dench on the backseat. Camilla also met the members of staff and volunteers at the Swiss Cottage as well as the volunteers and representatives of the Osborn Horse Trials which will open to the public on Wednesday. "I just wish I could stay a bit longer and have a swim in the sea. Sadly that’s not to be," Camilla said in an impromptu speech at the Royal Yacht Squadron reception. 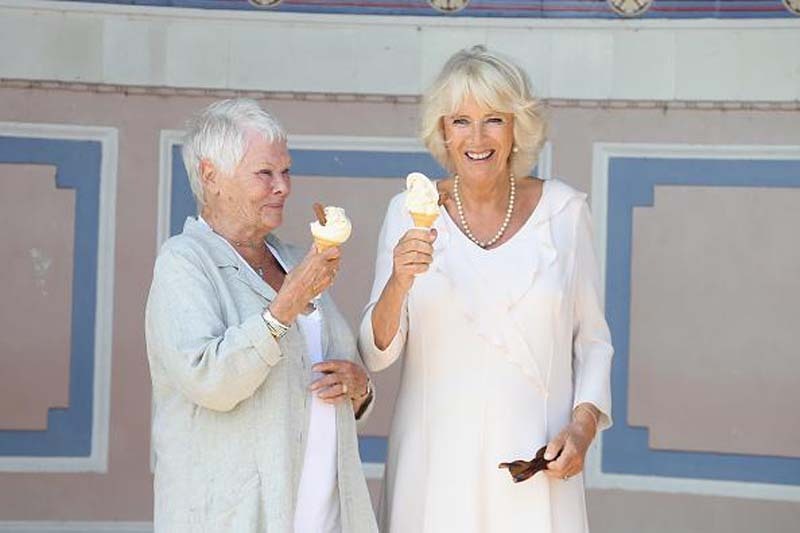 "Going to Osborne House is always such a treat as it was built by my great-great-grandfather and I feel very fond of the place," Camilla continued. "To come and launch Red Funnel 7 was very exciting, and it worked! Last time I launched a ship in Southampton I pressed the button and nothing happened… so I was very pleased today it ran like clockwork! So, thank you all very much and I very much hope I shall be back soon, hopefully on a holiday."